Luton equalled a club record of 19 Football League games unbeaten as they defeated Wycombe Wanderers 3-0 this afternoon. The Hatters, who had twice gone 19 games without being beaten in the late 1960s, always looked like they could match the sequence against the Chairboys, although needed sub George Moncur's late double to make fully sure of victory. The hosts made their first change in four games, with Kazenga LuaLua ruled out by a stiff hamstring, and Danny Hylton came in for his first start since his red card at Sunderland on January 12. Town came close on eight minutes, visiting keeper Ryan Allsop spilling Pelly-Rudddock Mpanzu's cross under pressure from Hylton and James Collins' rebound deflecting over the bar by the fortunate Joe Jacobson. Full back Jacey Stacey then made a vital interception before Adebayo Akinfenwa could shoot, while at the other end, he burst forward, sending over a low cross that Jason McCarthy just prevented Luke Berry from converting. Andrew Shinnie's bouncing attempt was comfortable for Ryan Allsop, the visiting stopper making an even better stop with his legs from Hylton, who looked offside, Berry putting the rebound well over. Allsop was sarting to become a busy man, gathering Stacey's driven cross at the second attempt, as on the half hour he could watch the same player's curler fly harmlessly off target. With Wycombe's much reported antics just starting to rile up the home supporters, their team responded in the best possible fashion as Hylton played a magnificent ball out wide to Stacey. 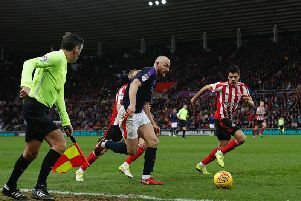 He looked up and sent over a cross that Collins, who else, got in front of Allsop to nod home for his 19th of the season and ninth in seven games. The encounter then started to really liven up, Hylton booked for clipping Jacobson, despite it being his first offence, Adam El-Abd cautioned after an incident which saw Sonny Bradley bundled into the net, the home skipper not impressed at all. After the break, Wanderers had a spell of pressure, stopping Town getting out as much as they had in the first period, but Luton stood firm, Bradley and Pearson both clearing their lines to stop their opponents from restoring parity. The Hatters gradually began to reassert their earlier dominance though, Alan McCormack high, wide and not very handsome on the volley after a ball dropped invitingly for him. Collins was far closer, transferring the ball on to his left and sending in a curler that missed by a matter of inches. Precious little goalmouth occurred for large parts, but with Akinfenwa leading the line, there was always a chance of something happening, Town's back-line needing to keep their wits about them. Sub Scott Kashket rifled into the stands, before Luton had the breathing space they craved with five minutes to go, thanks in no part to sub Jason Cummings debut. Off the bench, his produced a superb touch to bring a high ball out of the sky, beat two man with some nifty footwork and shoot low, Allsop parrying, unable to stop Moncur tapping home from a few yards. The duo then combined again for Town to put a real gloss on to the scoreline two minutes later, as Cummings twinkle-toed his way into the area, finding Moncur who stroked his effort into the corner. Town's result, a fifth straight leave victory, was made even better with scorelines elsewhere coming through, as also second placed Barnsley won convincingly, 4-1 at Gillingham, Sunderland and Portsmouth dropped points with draws at Oxford and Plymouth respectively. That saw the Hatters move nine points clear of Pompey in third place and a hefty 11 in front of the Black Cats, as although both teams do still have games in hand on Luton, neither possess anywhere near the same kind of momentum Town have garnered under interim chief Mick Harford. Hatters: James Shea, Jack Stacey, James Justin, Matty Pearson, Sonny Bradley (C), Alan McCormack, Pelly-Ruddock Mpanzu, Andrew Shinnie (Alan Sheehan 89), Luke Berry (George Moncur 73), James Collins, Kazenga, Danny Hylton (Jason Cummings 81). Subs not used: Harry Isted, Alex Baptiste, George Thorne, Dan Potts. Wanderers: Ryan Allsop, Sido Jombati, Joe Jacobson, Dominic Gape, Adam El-Abd ©, Matt Bloomfield (Nick Freeman 81), Paris Cowan-Hall (Luke Bolton 66), Curtis Thompson, Adebayo Akinfenwa, Nathan Tyson (Scott Kashket 71), Jason McCarthy. Subs not used: Anthony Stewart, Marcus Bean, Cameron Yates, Charlie Owens. Booked: Hylton 39, El-Abd 43, Collins 50.